PRIME BPM is a business processes improvement software with a simulation engine and built-in implementation methodology. Because of the latter, companies do not need to spend inordinate amounts training their personnel on different types of methodologies, as the solution helps users along the way. With PRIME BPM, key members of the workers are able to map every stage in work processes by using simple standards that are coupled with in-built validation rules. After which, they are provided with analysis results that suggest areas for improvement and the potential costs savings that can be gained by effecting a change. Further, PRIME BPM has the ability to simulate scenarios, something that employees can utilize to demonstrate to managers and executives the benefits of implementing a modification to the organization’s existing workflows. Aside from being a process mapping tool, PRIME BPM guides users through the entire process of improving their workflows. This is completed with only minimal human involvement, as users are only required to input tasks, roles, and other related data. After which, the engine analyses the mapped information and points out stages that can be improved upon to enhance company savings. From there, organizations can implement changes through the collaboration portal where employees can view them as well as provide feedback. 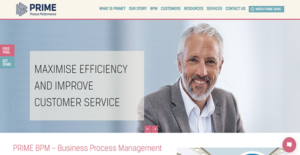 PRIME BPM is equipped with a costing engine that automatically calculates savings. This tool helps organizations see what they can gain by rolling out a change in one or more processes. Thus, they can demonstrate that effecting new rules equal fewer expenditures for further developments in the future. Executives like to see concrete evidence of benefits from a change. In order to provide that, employees can utilize PRIME BPM to show what could happen in specific settings. This is useful for demonstrating a change’s possible effects to executives such as the efficiency gain, cost savings, and resource maximization. Due to this, better-informed decisions can be made. Transitioning to a preferred state of organization can be challenging. However, with the aid of PRIME BPM’s improvement module, a company can make the process less arduous for everyone involved. The application component facilitates the smooth collaboration between teams for them to manage every step for complete and proper implementation and for benefits to be realized. PRIME BPM has its own in-built methodology for effecting organization-wide improvements. The application has created this best-of-breed solution from Lean, Six Sigma, BPM, and TQM, which walks users through the improvement journey. Thus, personnel do not need to have previous knowledge of any of these methodologies, allowing them to focus more on execution. Though PRIME BPM is a full-featured software, it is quite easy to learn. Its gentle learning curve allows employees to use its tools and navigate its interface with nary a problem. As such, even a new hire is empowered to utilize the application to create an effective change in the organization. What Problems Will PRIME BPM Solve? PRIME BPM aids organizations in documenting all processes and procedures and store them in a central cloud repository. The application also tracks such data by versioning to make sure that employees always have access to the most up-to-date information so they can go through workflows accordingly. PRIME BPM has a simulation engine that companies can utilize in doing on-the-fly what-if analyses. Data they gain by running different scenarios and case settings let them understand how they can save time and financial resources while ensuring the efficiency of their operations before committing or rolling out a change. A person’s role and the responsibilities they are required to attend to can sometimes be confusing and ambiguous. To help people understand their part in the organization better, PRIME BPM has a process mapping engine that captures information about tasks, documents, systems, and roles. These things can be connected to each other with the engine for employees to see who is responsible for what and what is expected of them for the smooth execution of processes. If you are considering PRIME BPM it could also be beneficial to investigate other subcategories of Best Business Process Management Software listed in our base of SaaS software reviews. Every business has its own characteristics, and may require a special Business Process Management Software solution that will be adjusted to their company size, type of clients and staff and even specific industry they deal with. You should not count on finding an ideal app that will be suitable for every business regardless of their history is. It may be a good idea to read a few PRIME BPM reviews first and even then you should pay attention to what the solution is supposed to do for your company and your staff. Do you need an easy and straightforward service with just essential functions? Will you actually make use of the advanced tools needed by pros and big enterprises? Are there any particular tools that are especially beneficial for the industry you work in? If you ask yourself these questions it will be much easier to find a solid solution that will fit your budget. How Much Does PRIME BPM Cost? PRIME BPM is a cloud-based solution that has an in-built methodology. If you are interested in including this in your software ecosystem, you can view a demo and request for a free trial on the website and ask for enterprise pricing information by phone, email, chat, or web form. We realize that when you make a decision to buy Business Process Management Software it’s important not only to see how experts evaluate it in their reviews, but also to find out if the real people and companies that buy it are actually satisfied with the product. That’s why we’ve created our behavior-based Customer Satisfaction Algorithm™ that gathers customer reviews, comments and PRIME BPM reviews across a wide range of social media sites. The data is then presented in an easy to digest form showing how many people had positive and negative experience with PRIME BPM. With that information at hand you should be equipped to make an informed buying decision that you won’t regret. What are PRIME BPM pricing details? What integrations are available for PRIME BPM? PRIME BPM can integrate with third-party applications like Microsoft SharePoint via API. If you need more information about PRIME BPM or you simply have a question let us know what you need and we’ll forward your request directly to the vendor.